The dolls and the breed changes are pixelated for me, which means, you barely can see, what that item is ._. What's with the burry ones? why are some all pixely? I am amazed at how much attention to detail was put into this website. Thank you for such an amazing game! <3 I'm so glad I was patient and waited to sign up for this. It's only open at certain times. I've been hearing about this for the passed two years, and I STILL cant wait for this to open! >u< so excited! I cant even! Hey what are the wings in the 2nd line from the bottom 6 row (they are red) Is it some sort of clothing? Haha. They're not inappropriate. They're just surprises that you're not supposed to know about yet. 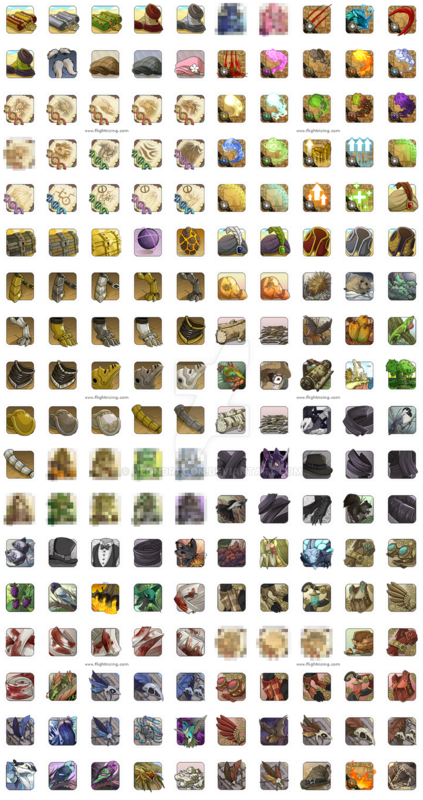 This collage was made by screenshotting a portion of the "icons" folder on my harddrive, then removing the file names. So I blurred out the stuff that are things you're supposed to discover on your own. The Seraph Gene didn't exist when this was created (Nov 2012). WHAT ARE THE BLURED STUFFS? Yeah, but the blurred out parts are the ones that still didn't exist, right? Ah, I have Icewarden, Earthshaker, Windsinger, Plaguebringer, shadowbinder, lightweaver, and flamecaller. Ooohhhh teh colorssss. These icons make the ones used in World of Warcraft look like utter GARBAGE by comparison! Props to you both - you make a fine team with these. Very nice. But why are some of them blurred out? In-progress/secret icons? totally awesome and btw your awesome to neon!!!!!!! xD!! poor Neon, having to copy/paste the answer to the blurry icon question xD!! I'm in love with the red steampunk icons, but why are some of them blotched out? I was sorting items alphabetically in my folders. We have 800 icons, so screenshotting and removing the file names and drop shadows was the easiest way to compile this list. The blurred out stuff is surprises you're not supposed to know about yet. this is amazing! could you draw a dragon with battle armor? You can equip battle armor on your dragons in Flight Rising. They look awesome! I can't wait to play this. (: Love the spider one. Egads you guys been busy! Why do some of the items appear to be censored? Oh, I kind of suspected as much.